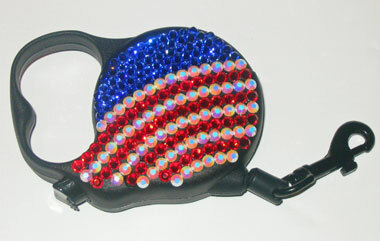 Boutique Blog-vintage inspired cigar box purses, pinup girl vanity cases, Tutu Bow Holders: Celebrate Fourth Of July ! Celebrate Fourth Of July ! Celebrate July 4th with Pride Diva's! Purse Hanger, Crystal Heart necklace or a Mini Retractable leash for your Diva or Dude Dog. All are designed with Swarovski Crystals.